Lemongrass, scientifically known as Cymbopogon citrates, is a tall perennial plant. It has thin, long leaves with sharp edges and belongs to the grass family. It is native to India and other Asian countries like Cambodia, Thailand, Malaysia, Guatemala, Vietnam and Indonesia. This grass is mainly used in Asian cooking and has a lemony taste and scent which is sweeter and milder. Lemongrass essential oil is extracted from the dried grass by steam distillation. This extracted oil is pale yellow and has a thin water-like consistency. 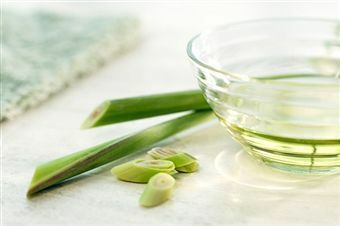 Except cooking, let's find out more usages of lemongrass essential oil. How Does Lemongrass Essential Oil Benefit Us? The oil is an effective cleanser for skin. Due to its antiseptic, antibacterial and astringent properties, it reduces the bacterial growth on your skin. Vitamin A, present in this oil, helps cure acne and pimples. The oil cleanses pores, strengthens skin tissue and acts as a natural toner. If you suffer from oily hair, itchy scalp, excessive hair loss or any other hair problems, massaging this oil on your scalp would help you get rid of them. The antibacterial properties of the solution would help keep your scalp clean and leave your hair fresh, shiny, odor-free and healthy. Lemongrass essential oil has a very calming and soothing smell that helps to relieve anxiety, uplift spirits and alleviate depression. Besides, the oil is a well-known sedative and can help increase the quality and duration of your sleep. You can mix it with your body lotion and massage the mixture all over your body. This oil helps to detoxify and cleanse your kidneys, liver, bladder and pancreas. Due to its diuretic properties, it can also help you remove excess harmful toxins and uric acid from the body. You can infuse lemongrass leaves in boiling water to make tea. Or you can just add a few drops of this essential oil in your tea or soup. The anti-atherosclerosis action of the herb prevents the intestine from absorbing excess cholesterol. Additionally, it helps oxidate bad cholesterol (LDL) in the blood, indirectly preventing the build-up of plaque in the arteries. What's more, the high potassium content of this oil helps to lower blood pressure significantly. Due to the presence of citral and limonene components, this grass inhibits the growth of bacteria and yeast, both internally and externally on the body. It is a known antibacterial agent against MRSA, pathogens, Salmonella sp., etc. It is an effective remedy against ringworm infections, athlete's foot or other fungal infections. Known as "fever grass" in many cultures, lemongrass essential oil has been used from ancient times as an antipyretic. Inhaling its vapor can increase perspiration and eventually reduce your fever. The oil can be very effective in treating aches or muscle pain, which accompany high fevers. Lemongrass oil helps to get rid of bad bacteria and increase the number of good bacteria in the colon. This can assist in treating digestive problems like indigestion, bloating, constipation, heartburn, diarrhea, flatulence, cramps, gastric ulcers, gastroenteritis, etc. The limonene content in the grass has anti-inflammatory properties that help in conditions like arthritis, asthma, Alzheimer's, cancer, diabetes, high blood pressure and Parkinson's disease. In addition, the analgesic properties of the plant relax muscles, relieve spasms or sprain, and consequently reduce pain. Lemongrass contains high citral and geraniol levels, which makes it a popular repellent against insects like ants, mosquitoes, flea, etc. You can make a mild spray by adding 5 drops of it to water and spraying on your pets. The herb acts as an astringent and helps in the contraction of gums, muscles, skin and hair follicles. Citral in the grass has the ability to fight against free radicals and inhibit the initial growth of cancer cells. Drinking tea with lemongrass oil can relieve menstrual cramps and soothe excess irritability and nausea. The essential oil has galactagogue properties which can help to increase the quality and quantity of milk production in lactating mothers. It also boosts your immunity and is very effective against flu or a common cold. Is Lemongrass Essential Oil Safe for Everyone? If used undiluted, the oil can burn or harm your skin because of its high citral concentration. If you are sensitive to this oil, you could experience skin irritations, rash and other general discomforts after application. People who are diabetic or hypoglycemic should avoid its application because this oil can reduce your blood glucose levels and is not recommended for people already on anti-diabetic or anti-hypertensive medications. Children, pregnant women or nursing mothers should not use this oil orally. People suffering from liver or kidney disorders should consult their physician before using the oil.